Once upon a time, which is how all the best stories of General Authorities start, President Kimball, the rest of the twelve, and several seventies headed to Denmark for a regional conference. Rex D. Pinegar was there and related it in the conference report. They, for some reason, decided to go to the Vor Frue Kirke (Church of Our Lady). It houses some sculptures by artist Bertel Thorvaldsen. Maybe it has something to do with the fact that this sculpture was done by him, and the Visitor Center in Salt Lake City copied it without permission. Standing in order along the two sides of the cathedral are the lifelike statues of the apostles, with Paul replacing the betrayer Judas Iscariot. As we looked at those beautiful works of art we noted that Peter was sculptured with large keys in his hands; John is holding scriptures. Others of the Twelve are shown with identifying symbols indicating, for example, the manner in which they earned a living or how they were martyred. President Kimball thoughtfully studied each statue. This is the famous Peter statue going to be referred to throughout. As we were ready to leave the cathedral, the Danish caretaker, a man about sixty years of age, was standing near the door awaiting our departure. President Kimball shook his hand, thanked him for his kindness in letting us visit the cathedral. Awww. Sweet old men giving gratitude for time spent. My dear friend, the man who created these statues was surely inspired of the Lord. The beauty and majesty of the Christus are wonderful. While Thorvaldsen was doing his work here, in 1821 to 1844 Joseph Smith was doing his work in America. Thorvaldsen didn’t have the gospel as did Joseph Smith, but he had the Spirit. He must have been inspired to create these statues of Christ and the apostles. He was trying to bring them to life. All Caps. Of course, shocking the church caretaker and putting weight on the Stake President of Denmark while beating his chest that he was better than some statues was a better story than Pinegar’s version, and so it was repeated in 1997. Then it was added to lesson manuals, published in books (page 128), teacher’s manuals, and is still in current lesson manuals. I knew “Bruder” Benthin while I lived in Germany and he rehearsed this story to me as well. Neither the prelates of Denmark nor the lay membership of the church hold the keys and the rights to declare doctrine, or to alter the interpretation of scripture in any way. And you can always expect me to remind people of this who try to claim otherwise. So why the renewed, softer version of the story? I know that the Rome missionaries have been told this story with the harsher words, and that they are copying the Vor Frue Kirke’s “Christus” and statues of the apostles for the visitor center of the Rome temple that is being built. …the visitor’s center is shown with a copy of Thorvaldsen’s “Christus” statue. 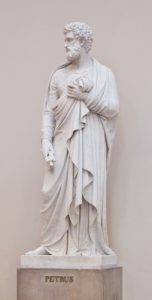 We have been told that not only will there be a copy of this statue, but of the original Twelve that he did while living in Rome in the 1800s. So, we love the statues, love the ideas, and Boyd K. loves the idea of pounding the “truth” of us having the keys into everyone in Denmark, starting with 60-year-olds who watch over churches. What does this look like from an outsider’s perspective? The story underscores the fact that the Mormons claim to be not only one Christian faith, but the unique Christian faith. Imagine if WarrenJeffs were to walk up to the SaltLakeTempleVisitorCenter. Imagine that he listened carefully and looked at all the paintings and the Christus there. Then, as he was leaving he said, “We are the living apostles, we have the KEYS!” to the missionaries working there. How crazy would he sound? That’s what Kimball sounded like to an outsider. Why do we repeat this story? Because we want to convince ourselves that we’re right. That was why Kimball said it to the caretaker and to those around him. The caretaker didn’t care. It was to sell the message to the already converted. Why didn’t kimball approach the dioceses of the Catholic church in Denmark that day with his message? Because it wasn’t to convince anyone on the outside, but to fire up the hearts of the convinced that they are right, powerful and needed. But honestly, it’s nothing more than chest-beating bravado if you can’t back it up with facts and dates; and a simple glance at wikipedia on priesthood restoration (pity the mission president, while quoting wikipedia, didn’t go a few steps further, eh) shows that the priesthood restoration completely lacks facts and dates. Beat on that chest, BoydK. Beat on it good. It’s all you’ve got. I am seeking to know the true facts as to how the Church approved statues, such as Christus statues in close proximity to Temples. I am unable to locate any scripture supporting an action such as this. The Savior declares in 3rd Nephi that He will destroy such idols carved from stones when He returns. Where is the latter day revelation from the Lord stating that such statues are now approved?